FOX Hits A Home Run With New Series, "Touch"
I just finished the pilot episode of a new show called Touch, which aired last week on FOX. Let me just tell you that the first episode was POW-ER-FUL! Ok, so what's the show about, right? Well, it's about a little boy who sees the world much differently than the rest of us. Having never spoken a word, he spends most of his time writing numbers in a notebook. To me, it's just googlygook, but to him it's something much more. In a story that unfolds amazingly before your eyes, this show reminds me of the movie Crash. It takes a bunch of random stories and tries to make sense of it all. I'd say they did a great job of orchestrating chaos into something meaningful and heartwarming. 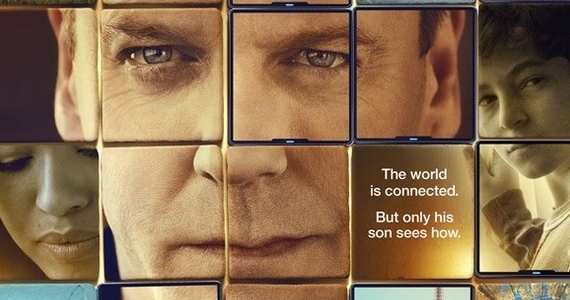 Kiefer Sutherland plays the boy's father, Martin Bohm, who currently works as a baggage handler at JFK International Airport. In the first moments of the show, we learn that the boy has a mind of his own and repeatedly escapes the school yard without notice. This causes problems for his father, who is the boy's only caregiver. Having been a huge fan of 24, I have waited impatiently for Sutherland's return to television. While he's not exactly Jack Bauer, Kiefer opens new possibilities with a refreshing role that will surely touch your softer side. I keep telling myself that it's Jack Bauer and that somehow makes it alright. It's like Ghost Whisperer for men. The show is amazing so far and I highly recommend it. If you haven't checked it out yet, I'd encourage you to stop by the FOX website and give it chance. The world premiere is scheduled for Monday, March 19, 2012.